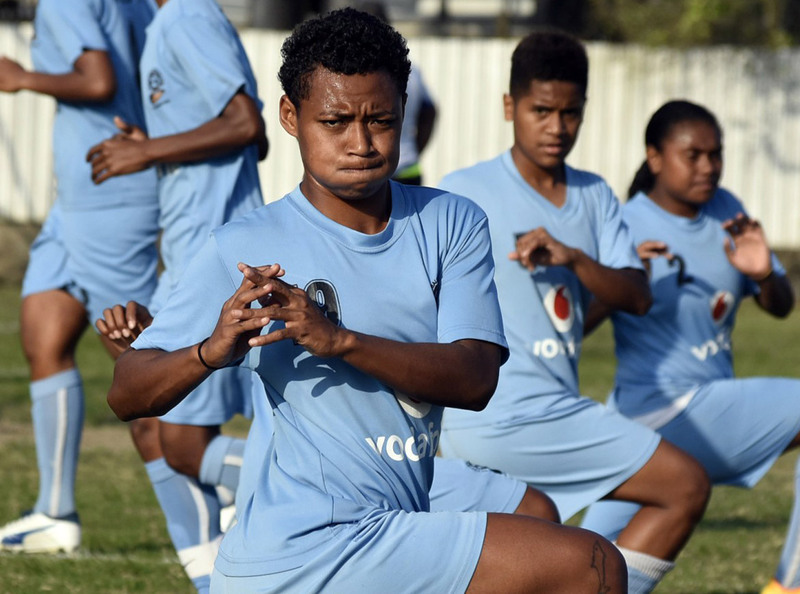 Viniana Riwai during a warm up with the Fiji women's national team. Viniana Riwai is a typical patriotic Fijian which is why whenever the opportunity crops up to represent her country, she welcomes it with open arms. It’s exactly this openness which has led to her making appearances both for the Fiji women’s football team, and the Fijiana 7s women’s rugby team. Riwai, who was part of the 7s team which took part in the 2016 Rio Olympic Games, is back with the national football team preparing for the OFC Women’s Nations Cup Qualifier which gets underway on home soil on Friday 24 August at Churchill Park in Lautoka. “I am always happy to fly Fiji’s flag, whether its rugby or football, because I love both sports,” Riawi said. The Cakaudrove lass began her football career with Labasa Muslim College before being selected to represent the district in the Inter District Championship in 2012 and 2013. After a reasonable period throwing the oval ball around, it has been a new challenge to make the return to football. “Returning to football will be a bit tough for me as I have been playing rugby where we use our hands and run with the ball while football is played with the feet,” the midfielder said. However she’s looking forward to the competition getting underway as she quickly gets back into the swing of things. “I know it won’t be hard for me because my teammates are very helpful and I have gelled well with them and hope to get back the touches of football soon,” said Riwai. “I am happy that I am once again given an opportunity to play for my country in football and will do my best to help the team qualify for the OFC Women’s Nations Cup. Riwai and Fiji will make get their OFC Women’s Nations Cup campaign underway against Pacific Mini Games 2017 gold medallists Vanuatu on Friday 24 August, with kick-off scheduled for 3pm local time.